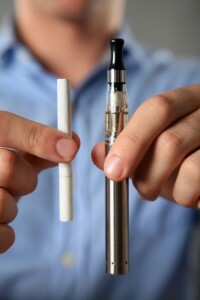 You see Electronic Cigarettes everywhere: restaurants, movie theaters, parks, malls, even in your neighbor’s hands. Over the past few years, electronic cigarettes have become a sought after product of the tobacco industry. They’re branded as a better alternative to smoking regular cigarettes because they use a battery-charged heating element to turn the nicotine cartridges to vapor versus smoke, claiming to mitigate the harmful chemicals inhaled. However, the question remains, are we replacing the bad with worse? Because of their discreet, modern look younger crowds are attracted to them. Not to mention, the endless array of flavors to choose from. It’s like stacking your scoops at the ice cream parlor. Except this sweetness may lead to lung disease. While there isn’t quite sufficient research on the long-term effects of vaporizing nicotine, many studies indicate harmful repercussions for users. After only five minutes of using the e-cigarettes, users experienced acute pulmonary effects, according to a 2011 CHEST study. These effects included increase in impedance, peripheral airway flow resistance as well as oxidative stress in the lungs. Of the people that are using them, most are inclined to use it for more than five minutes thus increasing the risks even more. The Federal Drug Administration wrote, “E-cigarettes may contain ingredients that are known to be toxic to humans, and may contain other ingredients that may not be safe.” They also mentioned that e-cigarette manufacturers are not required to submit clinical study data, meaning they are not transparently informing the public of potential harm. The FDA also projected an increase in addiction to nicotine as a result of the e-cigarette trend. Vaping nicotine, as opposed to smoking, is healthier. Studies proved e-cigarettes to help curb cravings, cope with tobacco withdrawal, and resist relapse. An online survey of nearly 4,000 participants reported that 96 percent said vaping helped them to quit and 92 percent said they smoked less. The odds are certainly in the smokers favor. It’s the non-smokers that really have to look out. E-cigarettes are seen as a gateway to full-blown tobacco using. The billion-dollar e-cigarette industry is sky rocketing in economic success. Competing tobacco products are certainly getting a run for their money. The Tobacco Vapor Electronic Cigarette Association now estimates that roughly 4 million Americans use the battery-powered cigarettes. To counter this popularity, major cities such as, Chicago, New York City and Los Angeles, have put a “vaping” ban on usage in some public space, hoping to discourage nicotine use. Especially because they are seeing an increase in younger generations’ usage. Between 2011 and 2012, the use of e-cigarettes doubled by teen and tween users. So what is all the puff about? It is certainly in the best interest for all to quit nicotine and tobacco use. But we all know cold turkey is, well, cold. E-cigarettes can help smokers turn a new leaf and leave smoking behind, but lets not make vaporizers the new smokers. If you want to learn more about the harmful effects of e-cigarettes on your body, please contact the Arizona Center for Chest Diseases.